Anonymous sale, Sotheby’s London, 20th July 1966, lot 385; bt. Klein for £50; American Private collection. To view eighteenth-century portratis for sale, please go to www.philipmould.com. William Chambers was one of the pre-eminent architects in England in the eighteenth century. He is probably best known as the creator of Somerset House. He enjoyed a stellar career under the patronage of George III, whose official architect he was from 1760 onwards. This portrait is a studio version of Reynolds’ three quarter length original in the Royal Academy. Reynolds and Chambers were not only close friends, but worked together closely in the formation and organization of the Academy. Reynolds conceived his portrait of Chambers as a pendant to his own self-portrait in doctoral robes, and the two finished pictures now hang side by side in the Academy’s public rooms. Chambers was born in Sweden, and like most Swedish architects of the day studied in Paris. Chambers was unique among European architects for having travelled as a young man to China to observe oriental architecture first hand, and it was initially as a Sinologist that Chambers gained a public reputation. 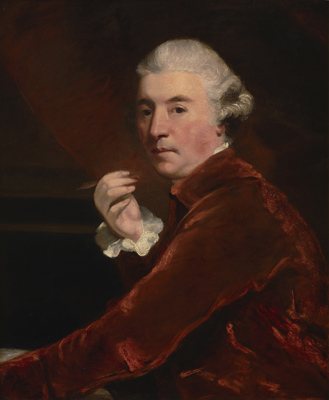 In 1757, after having met a number of English ‘Grand Tourers’ in Rome, Chambers made his decisive move to London, where he was appointed architect to the Dowager Princess Augusta of Wales at Kew, and architectural tutor to her son George. In 1759, Chambers solidified his importance when he published his celebrated Treatise on Civil Architecture. To Horace Walpole it was the ‘most sensible book and the most exempt from prejudices that ever was written on that science’. Its supremacy as the textbook for the orders and the proportions of architecture was not challenged until the end of the nineteenth century. On the king's accession in 1760 it was Chambers, and not his rival Robert Adam, who designed the resplendent state coach and refashioned Buckingham House. Chamber’s particular architectural legacy was his design of town houses. In London, Edinburgh and Dublin he designed several major houses, though sadly few of them survive. His greatest surviving work, Somerset House, took Chambers from 1775 until the year before his death in 1796 to complete, but succeeded in Edmund Burke's recommendations that it be an ‘ornament to the Metropolis’.